Want To See What Lady Gaga’s Meat Dress Looks Like Five Years On? 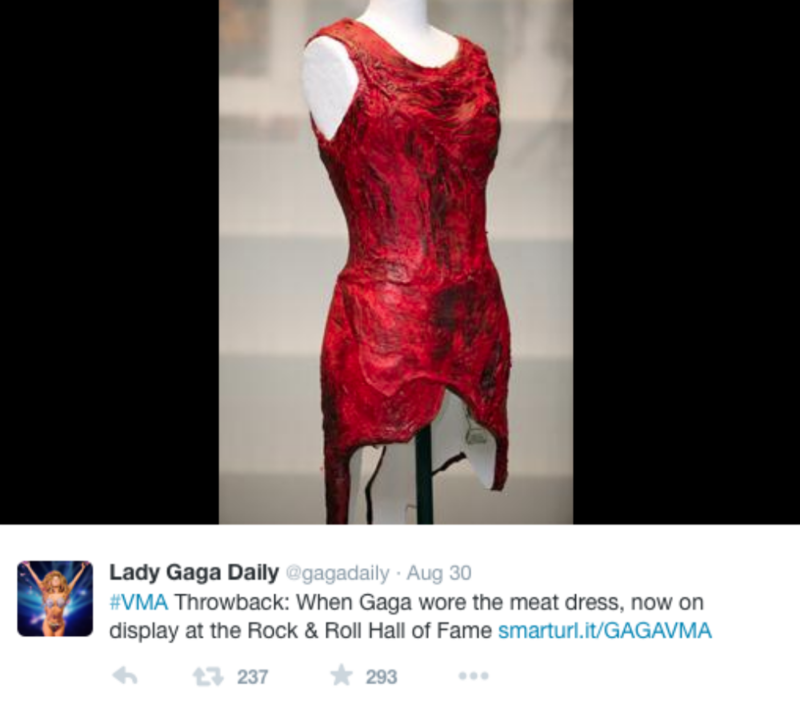 Remember the time that Lady Gaga casually strolled down the VMA catwalk wearing the now infamous meat dress…? Yeah, we do too. It’s practically etched in our minds and will likely be there forever. While we had kind of assumed that the ‘meat dress’ – as it became known – may have landed on someone’s plate at the after party on the night, it’s actually still around 5 years after the event. And we’ve got the pictures to prove it. Now inducted into The Rock and Roll Hall of Fame Museum in Cleveland, the dress is on display to the hard-stomached public. But while it’s been preserved with dye and formaldehyde, we have to say… it’s not looking too chipper. Which is what you’d expect, really. And although we’re not so sure that this one would have successfully survived a seasonal wardrobe cleanse, Gaga is obviously still gaga for her gown, as she actually still owns the dress. Each to their own, we guess. While it may not be looking too edible now, the dress caused quite the stir on the night and became almost instantly legendary. After all, if anyone was going to work a dress made out of meat it was going to be Lady Gaga and no other. Is there any other way to arrive to a party than in a giant egg? Known for pushing the boundaries, her steaky dress wasn’t the first occasion that the sometimes controversial singer songwriter made a lasting statement at an awards ceremony. 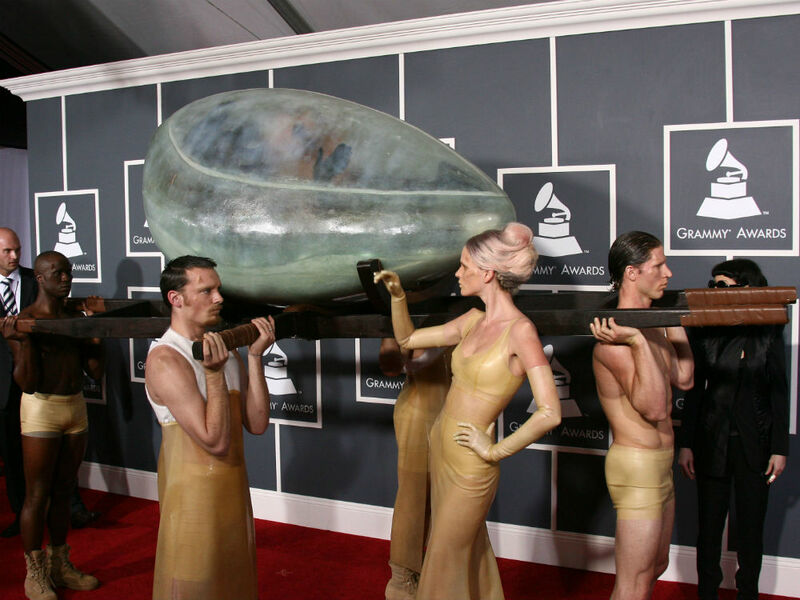 Her arrival to the 2011 Grammy awards saw the star emerge from a large egg on the red carpet in a homage to her song, ‘Born This Way’ – something which sounds like one of our dreams rather than a real life event. While we may not be rushing to buy a return ticket to Cleveland to see the dress in all it’s…glory…we can’t deny that it’s a pretty impressive feat to keep it in this state for so long – and we’re sure that Gaga’s loyal Little Monsters will be making the pilgrimage in their throngs.